Today is the first Sunday in March, which means it’s Clean Up Australia Day. This environmental effort encourages people to clean up their own communities, and the concept went global after Australia pitched the idea to the United Nations – hence the birth of Clean Up The World, whose clean-up campaign is held on the third weekend in September (the northern hemisphere autumn). Cleaning up seems suitable for the Lenten season, when we are supposed to be ridding ourselves of bad habits, and pulling back from the excesses of Christmas and New Year. Although Lent is an important period on the Christian calendar, it must have seemed natural to our ancestors, since late winter/early spring was a time of cleansing and purification to both the ancient Romans and the ancient Celts. This season was also the natural time for them to do their spring cleaning, and may have been inspired by the spring rains washing the land. In the southern hemisphere, Lent occurs in the late summer and autumn. However, many cultures hold their festivals of cleansing and purification in the autumn instead of the spring, tying them to the harvest and preparations for winter. For example, the Aztecs of central Mexico had Ochpaniztli, the Month of Sweeping, corresponding to the first twenty days of September. They didn’t just have a Clean Up Day – for three weeks, not only houses were cleaned, but everyone pitched in and cleaned the entire city. They also took communal sweat baths, that were designed to cleanse the body, mind and spirit. Then they fasted – not for a mere forty days, like Lent, but for eighty days. The presiding goddess of the Month of Sweeping was Toci, who was called The Mother of the Gods, and also Heart of the Earth. She was a goddess of healing, and venerated by healers and midwives. Another of her names was the “grandmother of sweat baths”, and she was also a war goddess. Her war epithet was Woman of Discord. 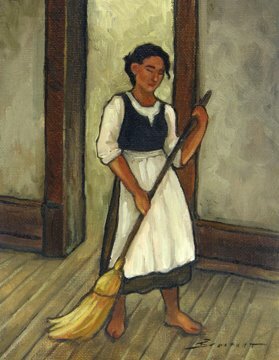 The Month of Sweeping was not only cleansing, but also a time for sowing corn, ritual dancing, and military ceremonies. It was a busy time of year. (If you have even a dim knowledge of Aztec society, you will be able to guess what else was performed during Ochpaniztli to honour Toci). Another of her names was Tlazolteotl, a goddess of purification who could cleanse both the body and the spirit. People confessed their sins to Tlazolteotl through a priest, upon which they were forgiven (although people confess their sins during Lent too, the Aztecs did it only once in their lives; I don’t know what happened if you sinned after your confession). Tlazolteotl sent people sexually transmitted diseases to punish them for lechery, but she would heal and forgive them too. She also inspired people with the desires to commit acts of lewdness … clearly she was a complicated goddess. She was called She Who Eats Sin, The Death Caused by Lust, and She of Two Faces. Slightly confusingly, under her two-faced designation, she was believed to consist of four different sisters representing different stages of a woman’s life: Tiacapan, Teicu, Tlaco and Xocotzin. Toci means “our grandmother” in the Nahuatl language, as she was a very ancient goddess. It might seem strange to give a baby a name that means “grandmother”. And yet obviously we hope our baby daughters will grow up to be old and wise, and we don’t have any problems giving them the names of their grandmother, or our own grandmother. There are several names in Native American languages which mean “grandmother”, so they must have been seen as appropriate. Toci only shows up a few time in the records as a name given to girls in Mexico, so this is a rarity even in its country of origin. English-speakers can pronounce the name something like TOH-see, to rhyme with Josie. Not only an interesting heritage choice, Toci has an elusive multicultural feel. Toci does almost qualify as a truly unique name. It’s simple, it’s not frilly, and is difficult to turn into a nickname. Its meaning is venerable, and its history dark and mysterious. I don’t think for a moment that the average person would choose the name Toci, but for some reason it fascinates me. Toci received an approval rating of 43%. 40% of people disliked the name, and only 8% liked it. Great post. I think Toci makes a really interesting name — and I agree with the idea that calling a child a name which means something like “grandmother” expresses a desire that she’ll have a long life and grow to be wise! I agree with you about it not being anything like any currently popular female name – although the ee ending sound is popular. She’d make for a fascinating pick. Yes I kept telling myself that the OH-ee sound was like Chloe and Zoe – but somehow I couldn’t quite convince myself that it FELT like Chloe and Zoe. I think it’s different, but not outrageously different; I think of it as the Aztec name most like ours!